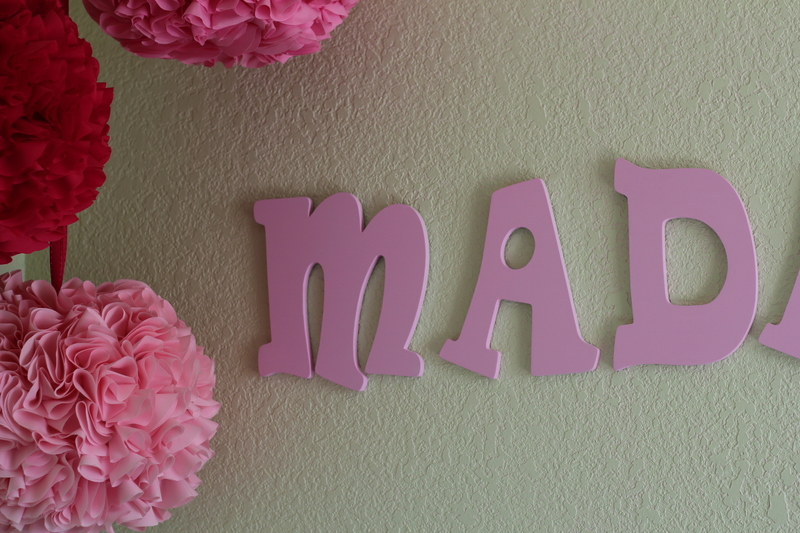 As I mentioned in my previous post, I have been working on a few little updates to Maddy’s room. I finally got around to taking some pictures of her room yesterday and here it is! 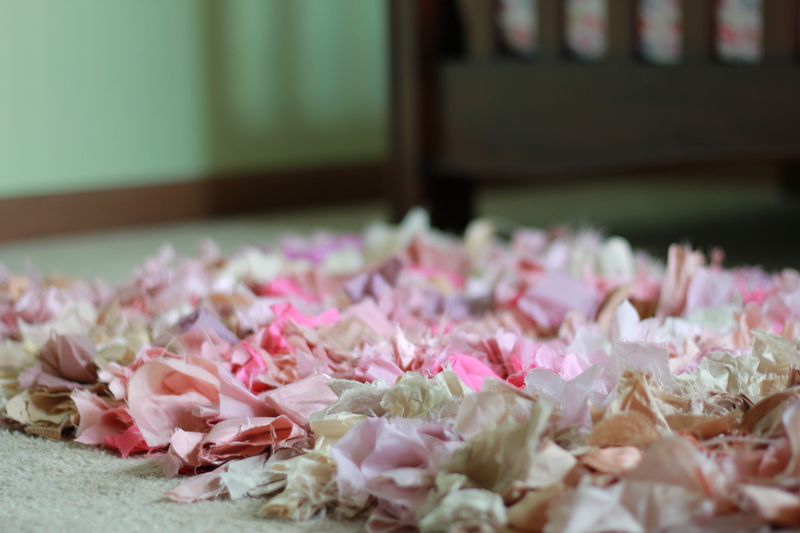 I love all the different shades of pink and purple in the rug! 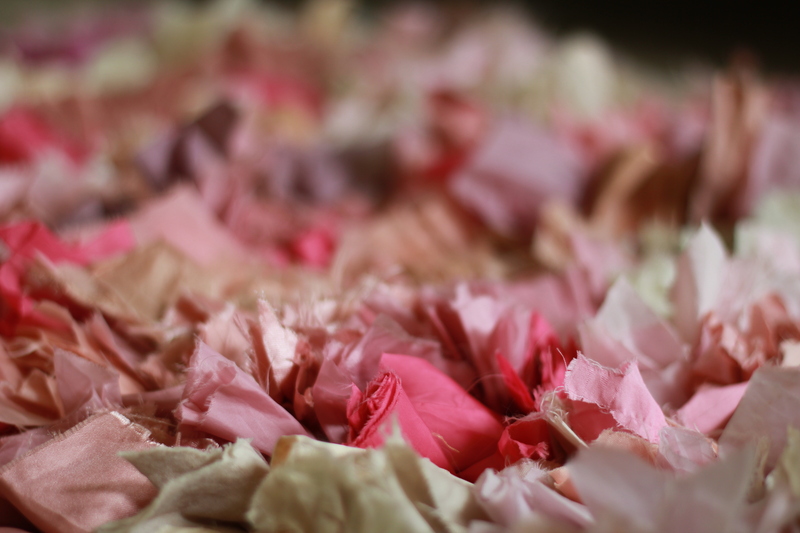 It really adds texture and warmth to the room. We have carpeting throughout our house in all the bedrooms, but I still wanted to add the rug to give the room some added dimension. I am really glad that I did! 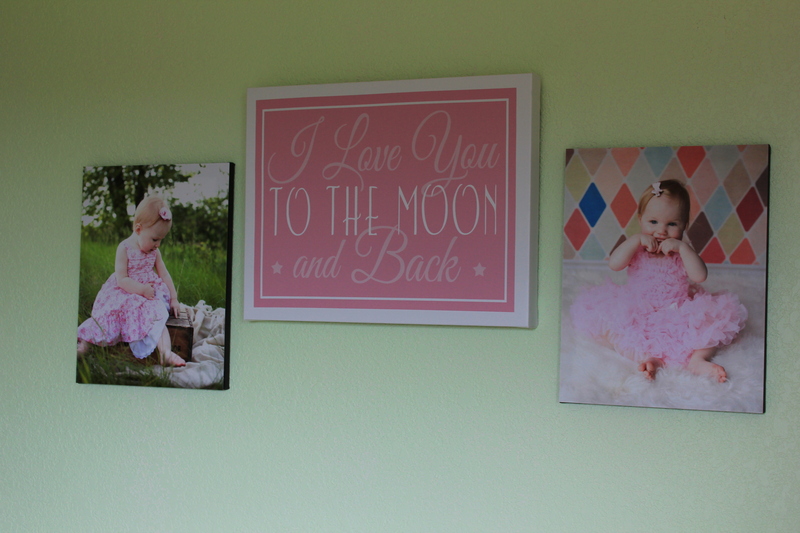 On an empty wall in her room, I added some more DIY canvas photos. You can see how I made them here. The prints were ordered through our wonderful photographer and friend, Lindsay of CARRstudios (www.carrphotostudios.com). 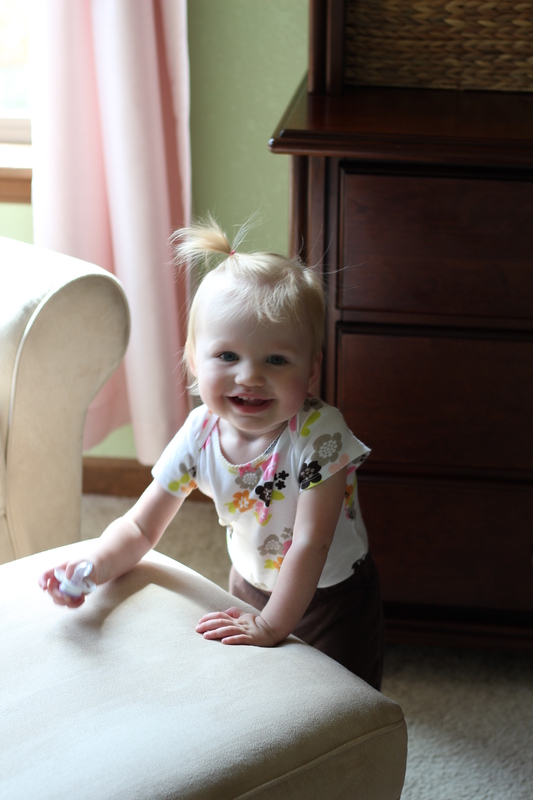 I love looking at our sweet girl in these pictures! The super cute sign from one of my absolute favorite books (“Guess How Much I Love You”), is from Hobby Lobby. It happens to match perfectly in her room and I could not be happier about that. 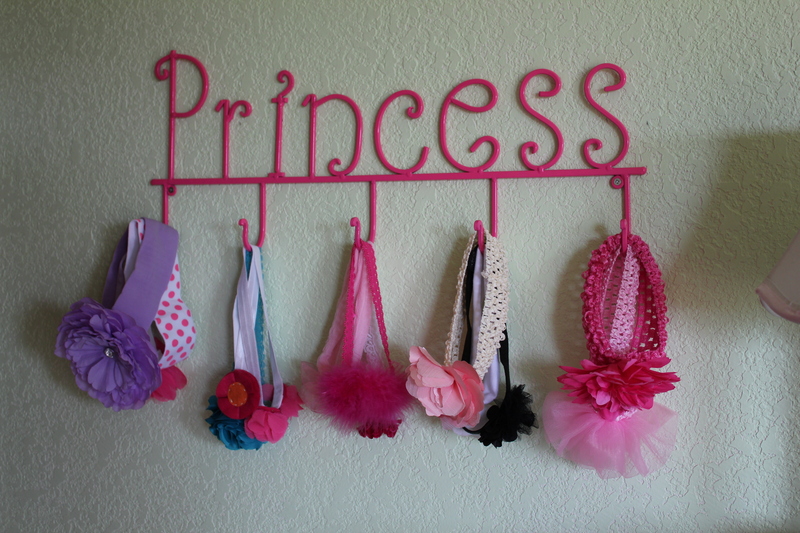 On the wall behind her door, we have a Princess hook, that I also found from Hobby Lobby. It is the perfect design to hold Madalyn’s little headbands. 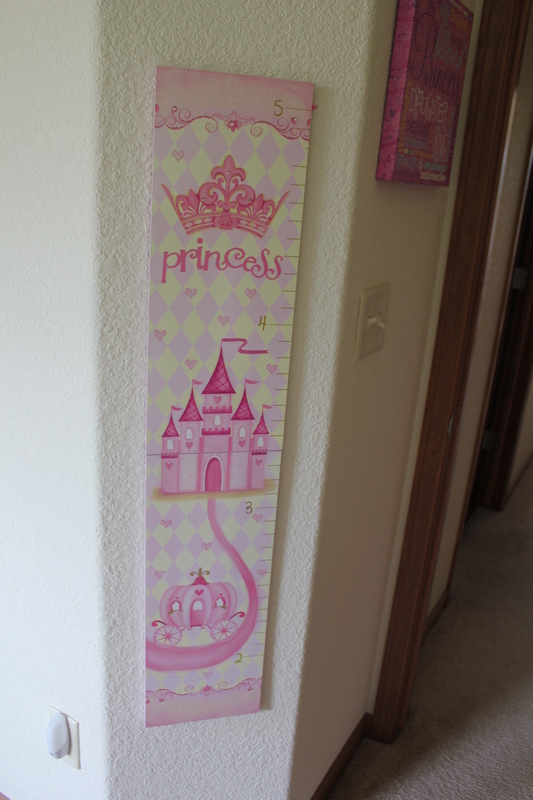 This girly growth chart is from Hobby Lobby, as well. 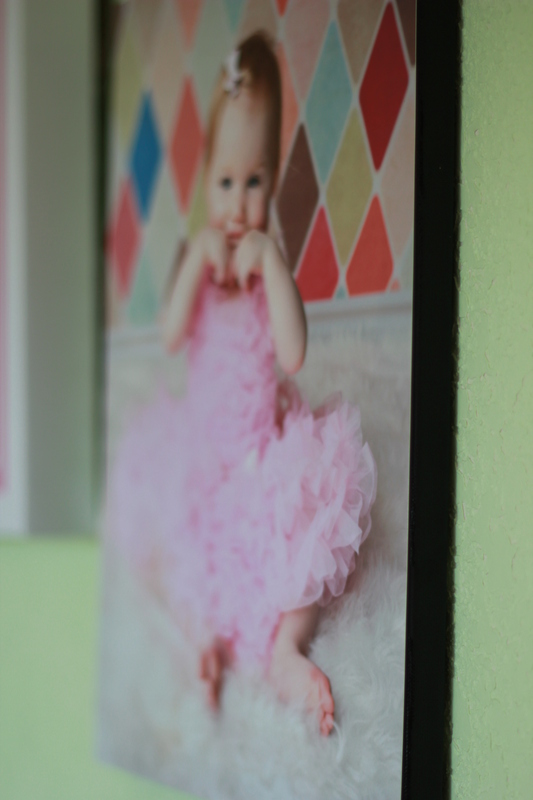 Maddy loves looking at it and it is the perfect thing to fill the space on this odd-shaped wall in her room. 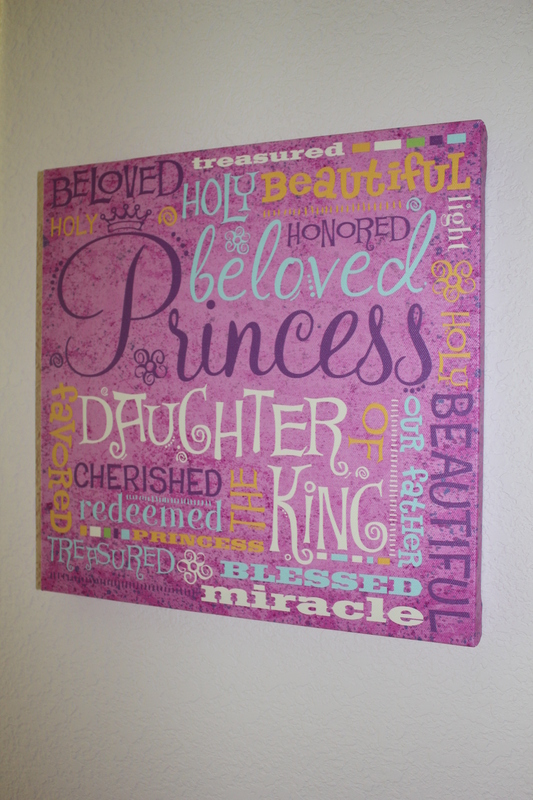 To add yet another “Princess” touch to Maddy’s pink room, I purchased this sign from Hobby Lobby. I love its message and I am so hopeful that Maddy will grow to know how cherished and beautiful she is in the eyes of the real King! 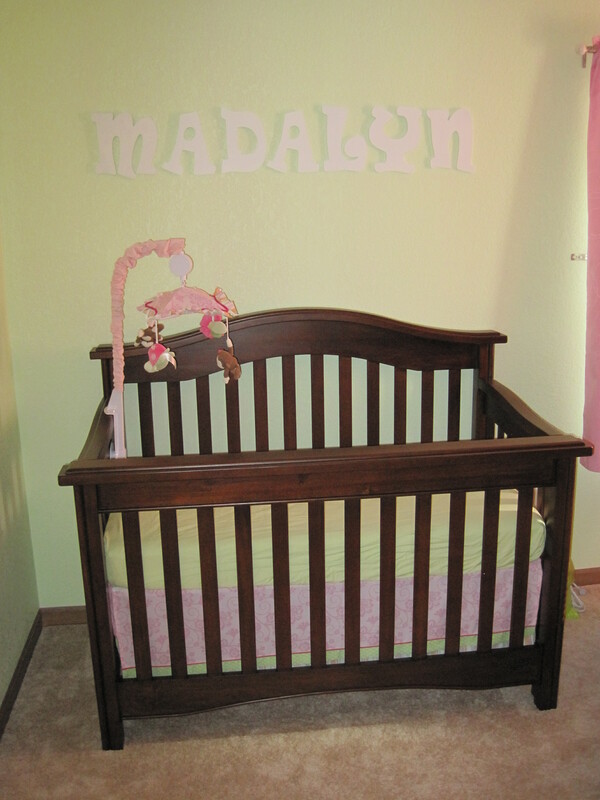 Another change I made to Maddy’s room since she was born is that I painted the wood letters spelling her name, pink. I LOVE how it looks now! Such an easy fix — all you need is some wooden letters and paint! 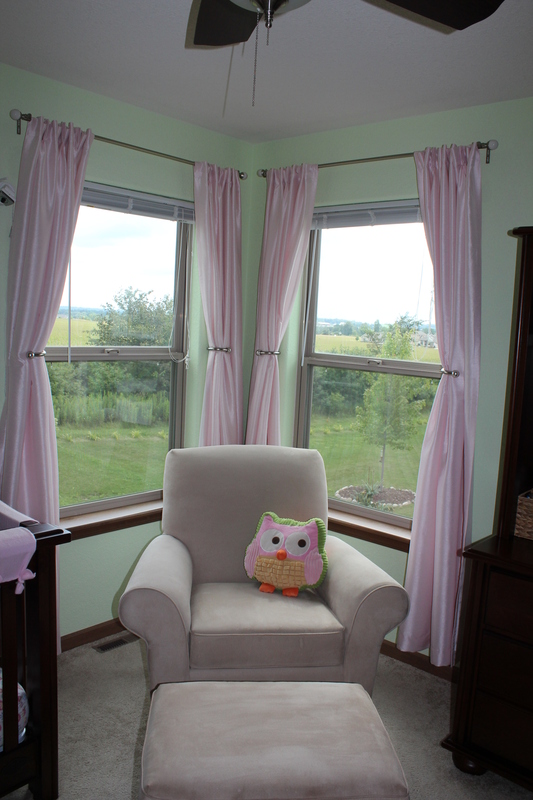 Now, the curtains: I purchased the original ones hanging in her room, from Target. They were cute and pink and I loved them! 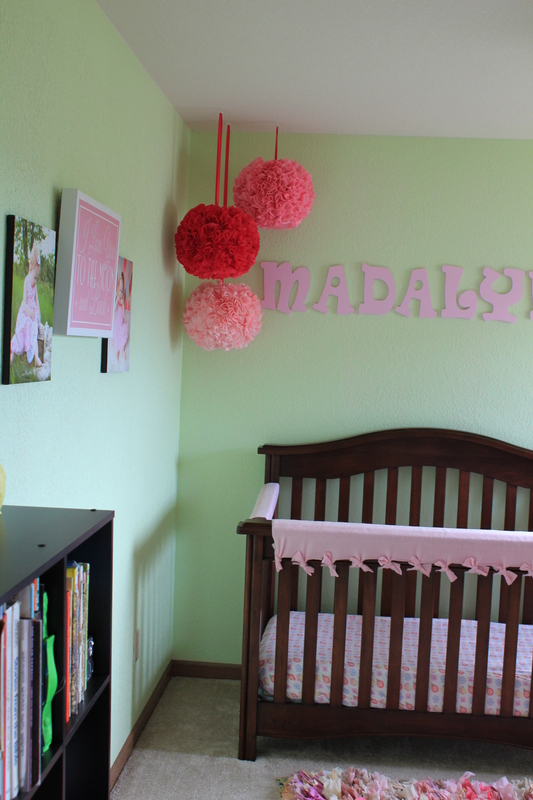 However, when I started thinking about the look and feel of Maddy’s room, I wanted something different. 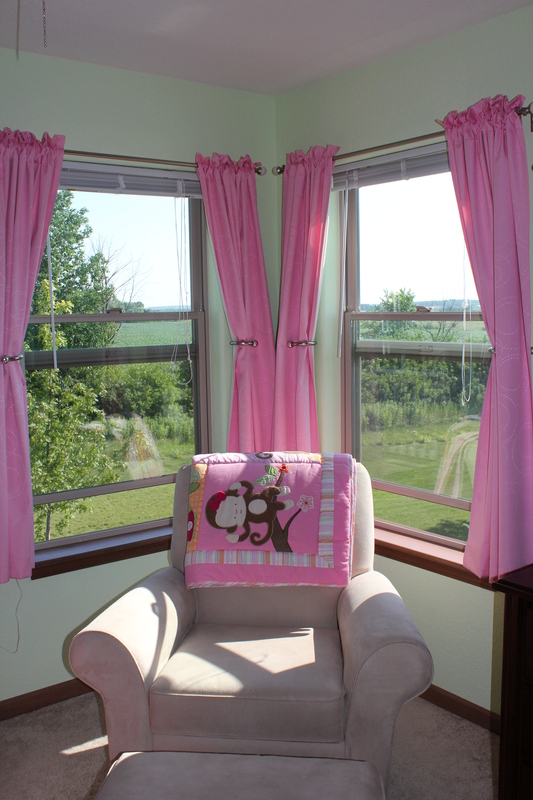 I found some long curtains, also from Target (Shabby Chic brand), and I love how they have really opened up her room! 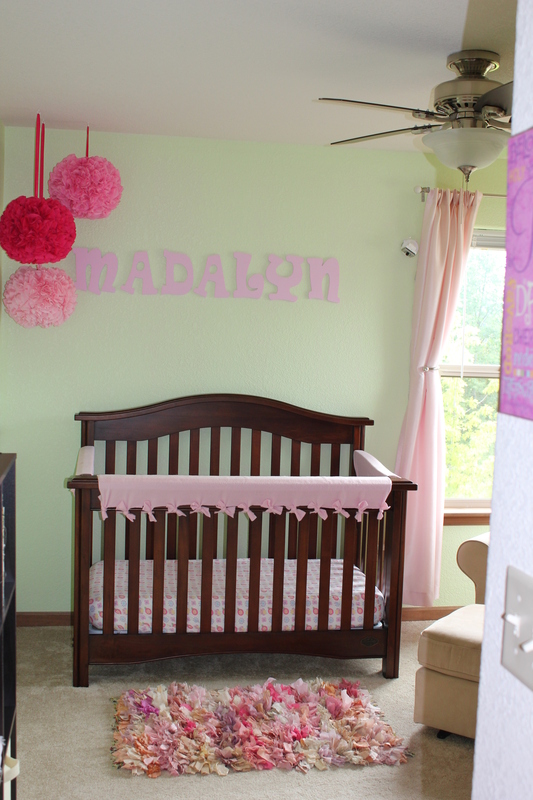 They have added height to her room giving it a more open-feel and the softer pink color makes her nursery seem a little more grown-up. 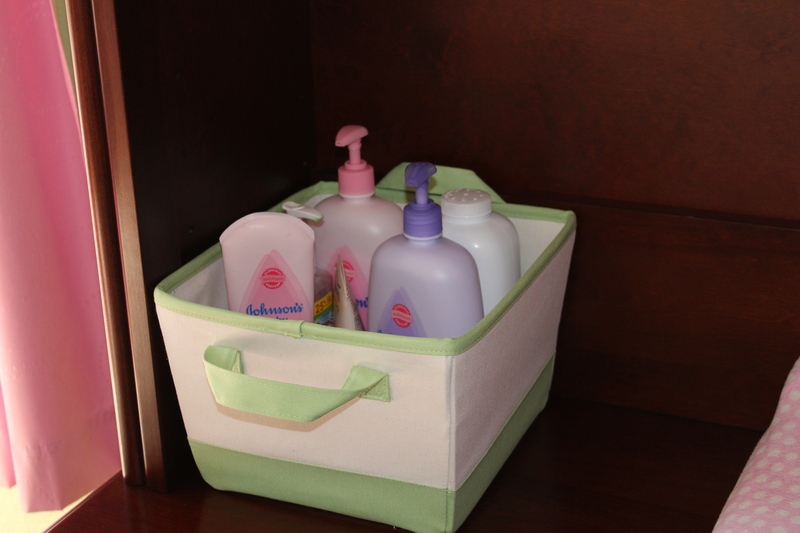 I also found a basket to use to store Maddy’s lotions and diaper wipes, instead of just a cloth bin. 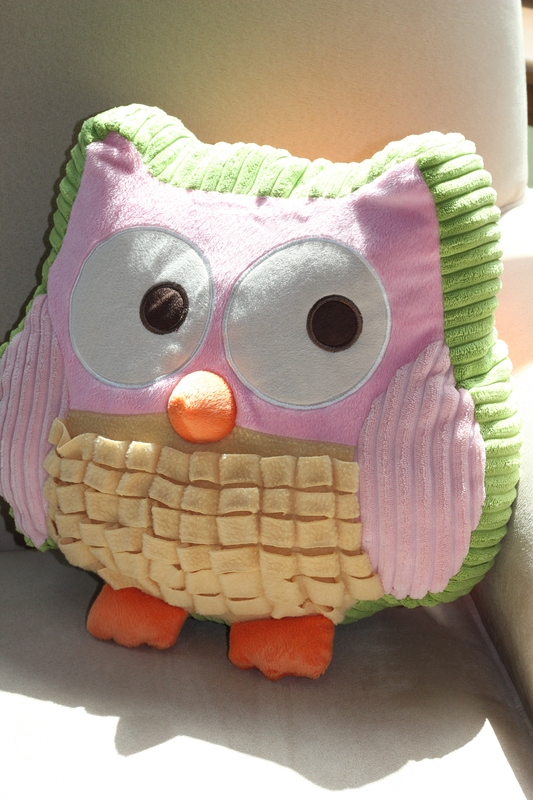 It’s another quick fix that adds a touch of elegance to a not-so-elegant thing! 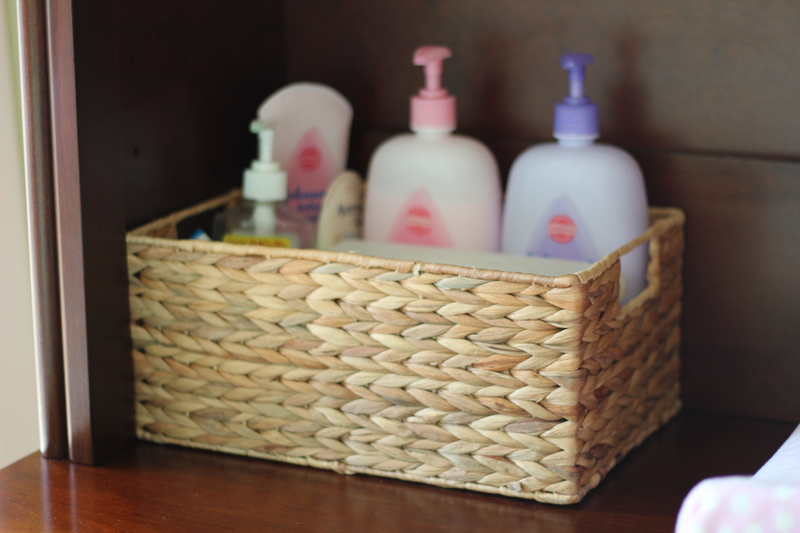 🙂 I purchased the basket from the Container Store for $7.99. (Check out this previous post on the hair bow hanger on the wall.) The picture frames are from Hobby Lobby and TJ Maxx and the “M” is from TJ Maxx. Well, that’s what we have for now! What do you think? 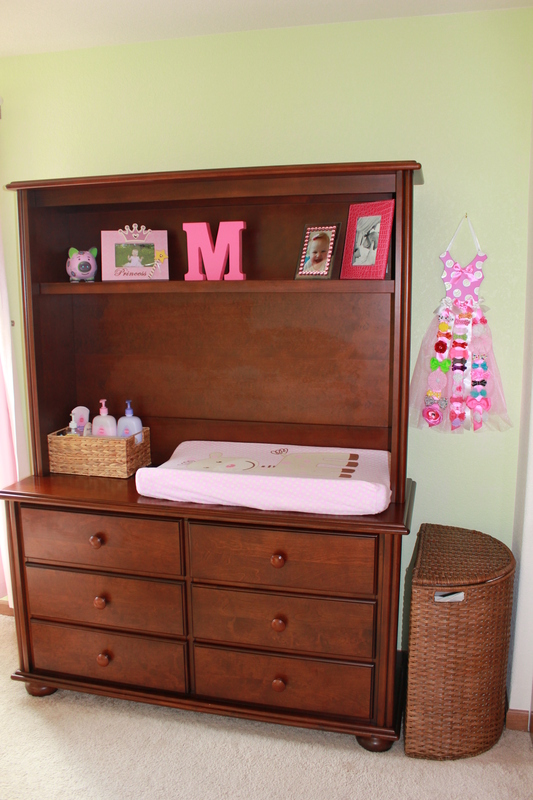 I love seeing our little girl’s room grow with her! She is just getting too big! We love her and her smile!